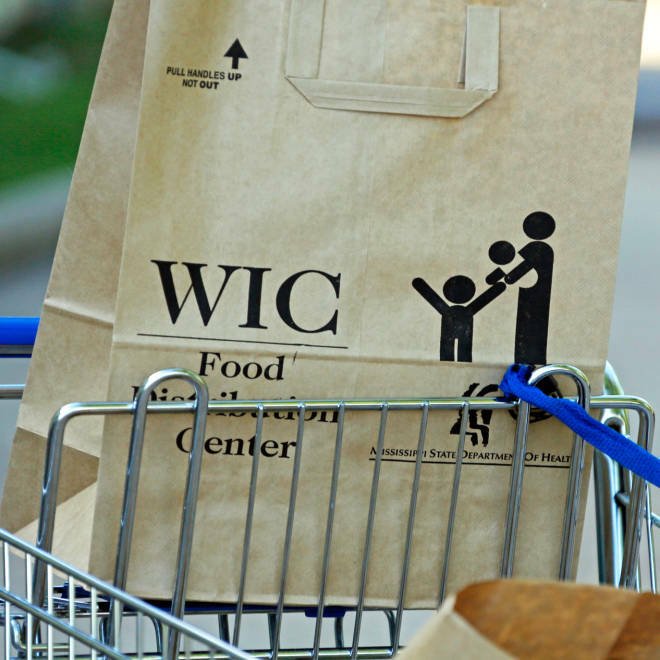 Low-income families depend on programs such as WIC, a Special Supplemental Nutrition Program for Women, Infants and Children, to raise their children. Only 19 percent of low-income third graders have "age-appropriate cognitive skills," according to a policy report released Monday by the Annie E. Casey Foundation. That number is a substantial drop from children in higher-income families, with 50 percent of those third graders hitting the age milestones. Seventeen million children under age 9 are considered low-income; a population the report says is at strongest risk for long-term developmental setbacks. The disparities widen for children of color with the study finding that only 14 percent of black and 19 percent of Hispanic children have age-appropriate cognitive skills. Aside from tracking school assessments, the study also found that many children are also facing developmental issues in areas of social and emotional growth as well as physical health and well-being. The report, titled “The First Eight Years: Giving Kids a Foundation for Lifetime Success,” argues that early development and investing in children starting from birth through age eight is critical for success, both in school and in life and that not addressing potential issues at an early age could diminish those successes. The report provides a number of policy recommendations ranging from programs to support parents and families, improving access to quality early care and ensuring comprehensive and coordinated care for children through age eight. For parents, the group recommended increased home-visiting and parental training programs for children at risk of falling behind in their development, health services for parents, as well as income support programs such as tax credits, Special Supplemental Nutrition Program for Women, Infants and Children (WIC) and the Supplemental Nutrition Assistance Program (SNAP). Noting that families in poverty needed greater and high-quality support systems, the report said that lower-income families often have a variety of stressors and financial burdens that can affect adequate care for children. Several unrelated studies have come to similar conclusions, finding that families in severe financial stress can have a harder time staying on top of a child’s development and achievement. Low-income households were classified as those below 200 percent of the federal poverty level at the time of the survey. The report also called for greater communication and linked data systems between children’s programs, citing that little information on a child’s development is shared between early care providers and school systems. Other recommendations include states adopting Early Learning and Development Standards with clear expectations for child development, regular developmental screenings for children, more experienced teachers and state-provided voluntary, full-day quality pre-kindergarten programs for all children, especially targeting low-income toddlers and children. The study uses an analysis of data from children who were in kindergarten in 1998-99 by the Early Childhood Longitudinal Study, a government program which tracks children over time.